A good preppy style, that’s my bagggg. I love anything which is all nerdy and that, although I have to be quite careful when dressing like some kind of school child; looking so young people often mistake me for a teenager anyway. 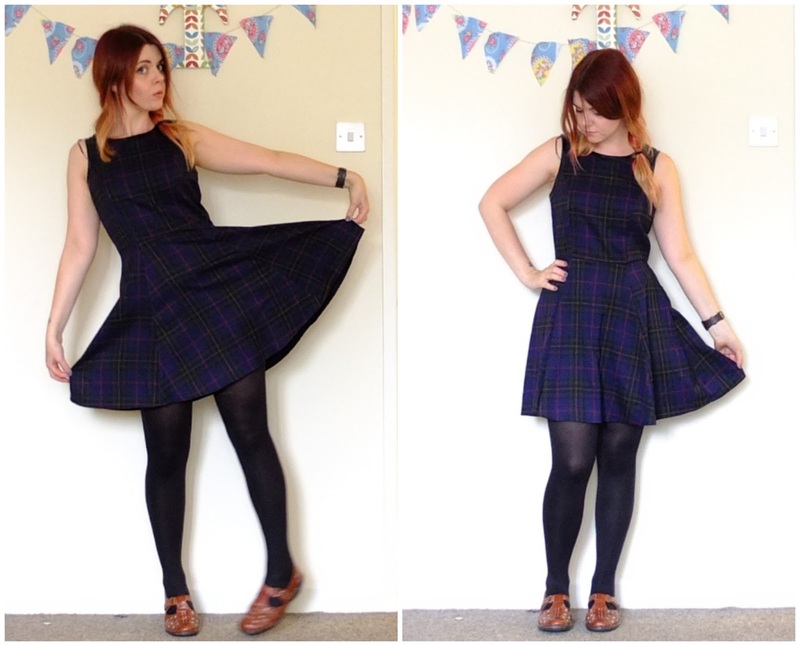 I’d been eyeing up the tartan skater style dress from G21 at Asda for WEEKS. I really really liked it, but something was stopping me from buying it, and I’ve no idea what because once I tried it on it was PERFECT. It’s so flattering and such a lovely light floaty material, it’s really very nice. After weeks of deliberation I got a message off Charl which said ‘Oh I think you might like this dress’ with a link to it… Well, that just confirms it doesn’t it? If someone see’s a dress and says it’s for me I simply MUST BUY IT. The G21 range has been a long time favourite of mine anyway, it’s always pretty cheap and they do some killer designs, every time I go to Asda I spend around 70% of my food shopping money on clothes, 20% on cat food and the remainder on instant mash potato sachets for myself. It’s a small sacrifice for such a stylish endeavour. It looks like I’ve bagged it just at the right time too, as it’s now not showing on the Asda website and in store they only had limited sizes left! A lot of people I’ve spoken to on Twitter about this dress (yes, my conversations online are always that stimulating) have said that they’ve had to size down when they bought this, and I can totally see that. I picked up the size 10 and it’s a little baggy around the waist and top of the back. I have looked for the size 8 but they don’t have it, but I wanted it a little looser anyway so when Autumn is in full swing I can wear a white or mustard yellow shirt underneath. Until I get such a shirt I’ve cracked out my favourite charity shop blazer, which comes in the form of the Paul & Joe one which I paid £5(!!!) for. When I got home and googled it the RRP for this thing was over £200, needless to say this is my favourite Charity Shop find EVER and I love it so. The G21 dress has a nice little leather-esque trim around the neckline which is a nice little contrast to the dress itself and the silkyness of the blazer. I love a good variation of texture I do! 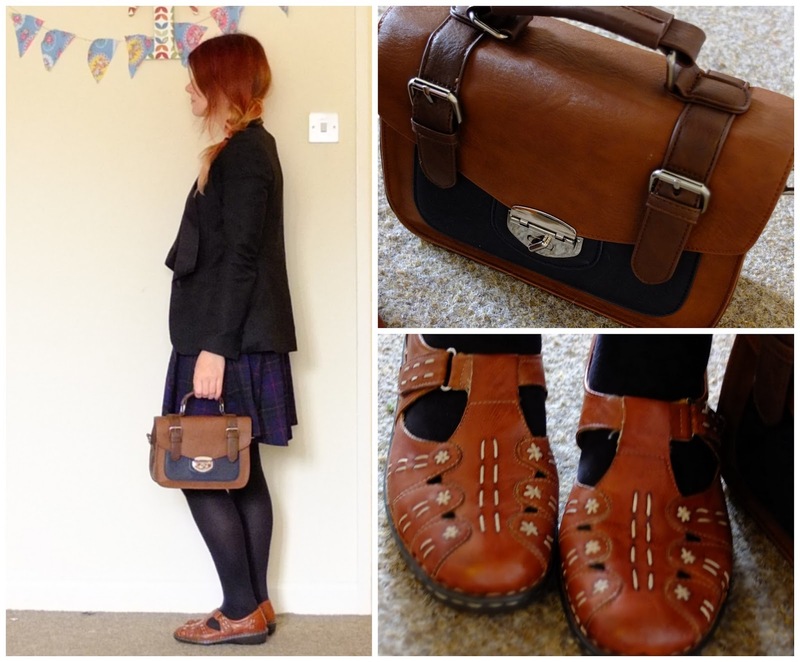 You may have seen me mention on Twitter my new shoes too – yay new shoes!! I know already they are not everyone’s cup of tea, but I absolutely love them. They’re the cute little geeky style I’ve been after for ages but begrudged paying £50+ for at Topshop for a similar style which aren’t even real leather! These babies cost £30 from a shoe shop which I think is predominantly for the elder ladies at Freeport called Pavers. I had to order them in as they didn’t have my size, but they came within 3 days and they are just so comfortable! I just wanted a pair of flat shoes that I didn’t really have to think about and were comfortable enough to wear daily and went with pretty much everything, and these tick all the boxes. The colour of them also goes perfectly well with my Great Plains Satchel which is the perfect size little bag for daily use too. The satchel has a detachable strap so that’s wonderful when wearing my blazer as I’m always scared a bag across it will bobble the material or something. I love a bit of practicality when dressing myself. I’m definitely a person who favours comfort over style but luckily things that are comfortable for me aren’t too hideous anyway (or so I keep telling myself!). 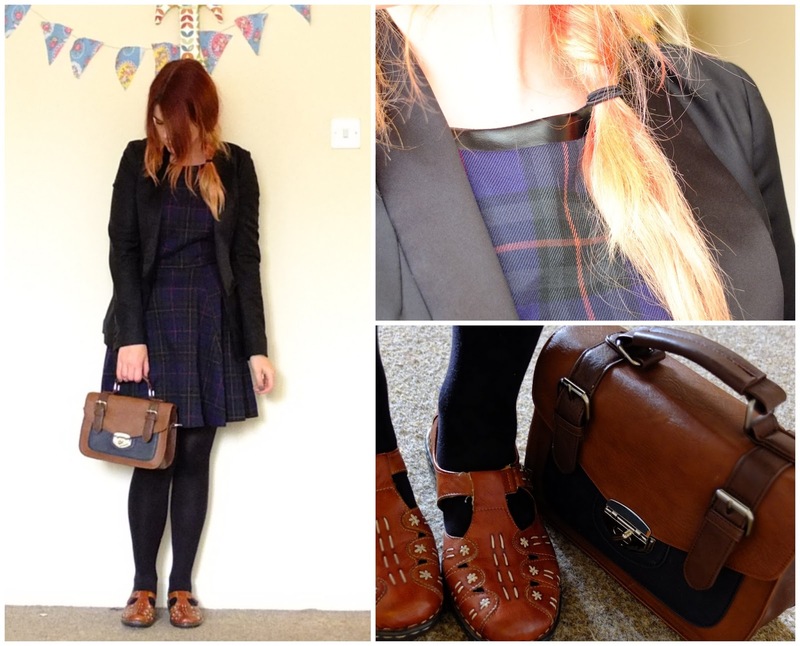 Speaking of all things tartan and punk and slightly preppy, let’s channel some edgyness too. I dunno about you, but I remember having some awesome lace up boots like this when I was a teenager. These black lace up boots from spylovebuy.com are a more grown up version of the ones I used to have and I’m pretty darn tempted to purchase (especially because I need some new Autumn/Winter boots after the death of my last ones a few months ago). Teamed with the aforementioned tarten skirt from G21 and a plain black T Shirt with a cute leather collar from New Look it’s simple and *soooo on trend dah-ling*. Throw on your trusty faux leather biker jacket and you’re good to go crunching some leaves and kicking snails in this ensemble!